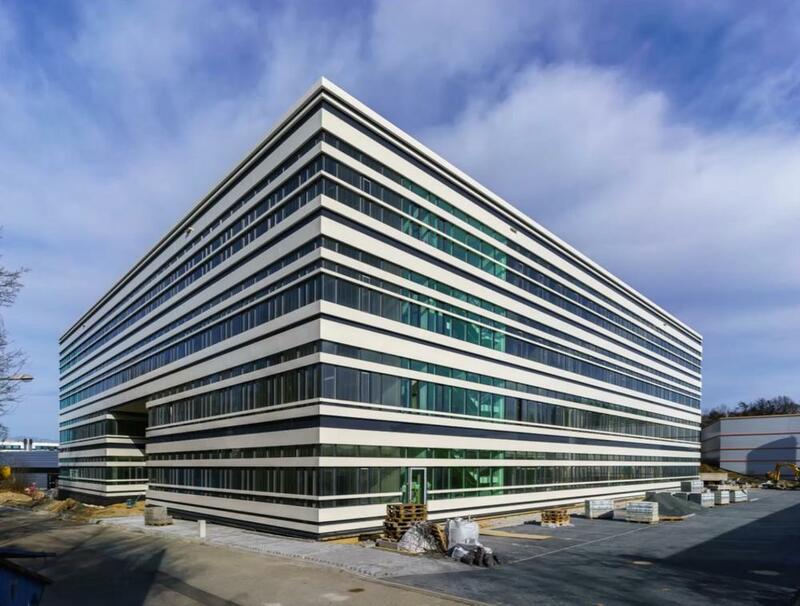 Today, the Centre for Structural Systems Biology celebrates its grand opening on the DESY Campus in Hamburg. In this new interdisciplinary research centre, scientists from ten different research institutions will work together on some of the most challenging projects in structural biology: the functioning of viruses, bacteria and parasites. The research focus of CSSB will be on the elucidation of structures, dynamics and mechanisms of the infection process of these pathogenes. With these achievements, CSSB scientists seek to contribute to the development of novel treatments and therapies. Ceremonial hand-over of the key: Schleswig-Holstein´s Scientific Senator Oliver Grundei, DESY Director Helmut Dosch, Bärbel Brumme-Bothe from the Federal Ministry for Education and Research, CSSB´s Scientific Director Matthias Wilmanns, Lower Saxony´s Minister for Science Gabriele Heinen-Kljajić and Hamburg´s First Mayor Olaf Scholz (from left, photo: CSSB/T. Mavric). Hamburg’s First Mayor Olaf Scholz, Lower Saxony’s Minister for Science and Culture, Gabriele Heinen-Kljajic and other representatives from regional government joined local businesses leaders, members of all CSSB partner institutions and the international scientific community in celebrating this momentous occasion. 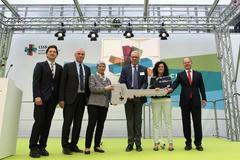 With a view of the new building, over 500 guests applauded as Helmut Dosch, Chairman of the DESY Board of Directors, presented Matthias Wilmanns, CSSB Scientific Director, and Dirk Heinz, Chairman of CSSB Council with a ceremonial key thus marking the official begin of scientific research in the new CSSB building. “The new Centre for Structural Systems Biology on the DESY Campus is a superlative cooperation: ten partner institutions will be working together on interdisciplinary research projects. The cooperation of infection biologists, physicists, chemists and physicians is unique and embedded in a world renowned research infrastructure spearheaded by the European X-ray laser. 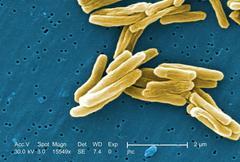 The systematic approach to combatting infection is trend-setting. I am therefore convinced that CSSB in just a short time frame CSSB will become a new beacon of science in Northern Germany,” explains Helmut Dosch, Chair of the DESY Directorate. “CSSB is a further advancement in institute and interdisciplinary collaboration in Germany. 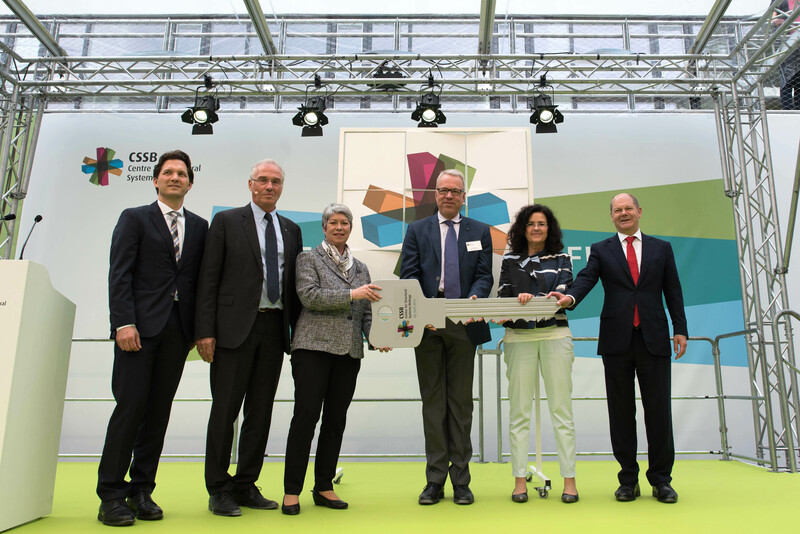 This innovative cooperation of ten different research institutions from the life sciences on the DESY Campus in Hamburg will bring infection research a definitive step forward,” states Johanna Wanka, Federal Minister of Education and Research. “The grand opening of CSSB is a milestone for interdisciplinary infection and resistance research. Here the scientist have access to European-wide, unique light and X-ray sources and therefore the chance to combine structural, infection and systems biology. Thus creating in Hamburg a novel research focus that places the complex processes and interactions between pathogens and their hosts in the limelight,” states Olaf Scholz, the First Mayor of the Free and Hanseatic City of Hamburg. Schleswig-Holstein’s Scientific Senator Oliver Grundei wished the CSSB and its staff a successful start. “CSSB should develop a joint profile that shines over Northern Germany,” says Grundei and emphasized that this works only with collaboration. The contributions of the German Federal government and states of Hamburg, Lower Saxony and Schleswig-Holstein have provided both the space and the infrastructure. “This was not easy as it means thinking past the normal boundaries of funding and politics. We were able to accomplish this,” says Grundei and thanks the CSSB Directorate and team “for their intensive pioneering work” in the last weeks and months. 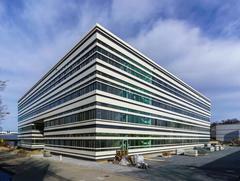 The new CSSB building (photo: E. Weckert, DESY). The new CSSB building, specifically designed to enhance collaboration, innovation and mentoring opportunities for young researchers, will provide scientists with state-of-the-art, in-house technology as well as direct access to DESY’s world renowned X-ray light sources like the synchrotron storage ring PETRA III, and the nearby free-electron laser, European XFEL. The four-storey building with its combination of laboratory and office space will be home to approximately 180 scientists and staff. The construction of the building was financed by the Federal Republic of Germany, the Free and Hanseatic City of Hamburg, the Federal State of Lower Saxony and the Federal State of Schleswig-Holstein.